"This museum is a step forward for us," Amadou Moustapha Dieng, a Senegalese arts journalist, told the BBC. "I know there are important relics which I'm not able to see unless I go abroad, but now [with] this space, we can get back the relics and Africans can come here now and see this was their history." 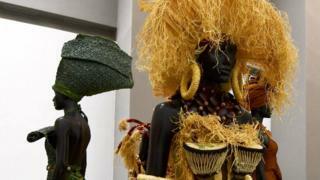 In November an experts' report, commissioned by France's President Emmanuel Macron, recommended that African treasures taken without permission be returned to their countries of origin. Senegal's Culture Minister Abdou Latif Coulibaly told the BBC he welcomed the French report as "every piece from Senegal is in France". What do you know about Africa's 'looted treasures'?